OpenNebula is used to implement different types of cloud deployments, from clouds tuned to address the demands of a niche market to clouds optimized to manage the virtualized resources in the data center. Here we try to illustrate the most common types of cloud deployments with OpenNebula, and how OpenNebula offers unique features that allow organizations to accelerate their transition to these types of cloud and so to adopt a more efficient, agile service delivery model. Many leading organizations use OpenNebula as an infrastructure management tool for building enterprise private clouds to simplify and optimize internal data center operations. These organizations see private cloud as the next logical step after server virtualization and consolidation. Enterprise-class clouds provide access to a security-rich, flexible environment for production workloads to help reduce costs, shorten cycle times for faster time to market and improve quality. The most widely used hypervisor in enterprise environments is VMware. OpenNebula is a good choice to manage ESX servers, and comes with many other goodies. For instance, you will be using a flexible platform that fits into your environment, and an open solution (so avoiding vendor lock-in), based on standards and interoperable with other hypervisors. What Are Our Unique Functionalities to Build Enterprise Private Clouds? Compared with other open-source cloud management platforms, OpenNebula comes with all the ingredients needed to build and manage Enterprise Clouds and support production workloads. Single Install and Upgrade Process: OpenNebula comprises all key functionalities for enterprise cloud computing, storage and networking in a single install, and ensures its long term stability and performance through a single integrated patching and upgrade process. Stable and Proven: OpenNebula is rigorously tested through an internal quality assurance process and by a large community with scalability, reliability and performance tested on many massive scalable production deployments. Support: You can receive best-effort community and SLA-based production support directly from the developers. Integration with Data Center Services: OpenNebula is fully platform independent with broad support for commodity and enterprise-grade hypervisor, monitoring, storage, networking and user management services. Highly Customizable: Because no two enterprise data centers are the same, OpenNebula can be easily adapted to fit into your data center and leverage existing IT investments. Virtual Infrastructure Management Adjusted to Enterprise Data Centers: The entities that OpenNebula work with, as abstractions of the physical and virtual resources, are a reflection of the typical resources found in enterprise Data Centers. These data models, a complete life-cycle management, an advanced monitoring and accounting system, and fine-grained multi-tenancy enable advanced techniques for capacity and performance management. High Availability and Business Continuity: OpenNebula brings support for high availability architectures, a persistent database backend with support for high availability configurations, and configurable behavior in the event of host, VM, or OpenNebula instance failure to provide easy to use and cost-effective failover solutions. OpenNebula is widely used as an infrastructure provisioning tool to build hosting and public cloud services. OpenNebula enables elastic, flexible, multi-tenant cloud environments customized to offer infrastructure as a service or to engine software and platform as a service clouds. There are features in OpenNebula that makes it the ideal candidate to offer a cloud service while, at the same time, cutting costs as well as offering a strong and robust management. What Are Our Unique Functionalities to Build Cloud Services? On-demand Provisioning of Virtual Private Clouds: In this new cloud offering scenario, the cloud provider provides customers with a fully-configurable and isolated Virtual Data Center where they have full control and capacity to administer its users and resources. This combines a public cloud with the protection and control usually seen in a personal private cloud system. Users can themselves create and configure servers via the SunStone portal or any of the supported cloud APIs. The total amount of physical resources allocated to the virtual private cloud can also be adjusted dynamically. Accounting and Metering: The level of detail and easy integration of the OpenNebula accounting and monitoring systems makes this cloud management platform a smooth companion for a broad number of billing platforms. Multiple User Interfaces: The ability to offer the same infrastructure in many different ways is very appealing for hosting and cloud consumers. OpenNebula offers a virtual computing environment accessible through two different remote cloud interfaces, OCCI and EC2, and through two simple web interfaces, OpenNebula Sunstone and OpenNebula SelfService. These mechanisms access the same infrastructure, i.e. resources created by any of the mentioned methods will be instantly available on the others. Scalability: This is a must for the hosting and cloud world, and OpenNebula comes in with a very robust and scalable core and a scalable architecture based on Zones and clusters, with many benefits in the area of distributed storage. Isolation: The ability to enforce a complete separation in all the virtualization resources that it manages (images, virtual machines, virtual networks, templates) through permissions or even fine-grained Access Control Lists, coupled with the ability to handle almost near isolated clusters gives OpenNebula the ability to securely operate multi tenancy environments. The multiple-zone support extends this functionality to easily manage fully isolated zones that can be located at different data center sites under different security policies and practices. Integrating with Your Existing Infrastructure: OpenNebula allows for the use of cost effective open source hypervisors, as well as aid in the transition from proprietary virtualization solutions. Audit Trails and Reporting: OpenNebula generates detailed log files for the different components that maintain a record of significant changes makes life easier at the time of locating errors and keeping a log of what’s going on in the infrastructure. Limitation of Resource Consumption: OpenNebula brings resource quota management to allocate, track and limit resource utilization. Ensure Application Availability and Business Continuity: OpenNebula allows configurable behavior in the event of host or VM failure to provide an easy to use and cost-effective failover solution. Differentiate your Service: Hosting and cloud providers need to differentiate themselves from their competitors. OpenNebula GUIs and interfaces can be easily adapted to address the needs of your customers, and the architecture of your cloud can be designed to serve different type of customers and workloads based on different SLAs, from low-cost to premium solutions. OpenNebula is the most widely used cloud management platform to build high performance computing and science clouds for hosting virtualized computing and data processing environments and for providing users with new innovative “HPC as a service” resource provisioning models. These HPC optimized clouds provide access to flexible and elastic scientific and technical computing to solve complex problems and drive innovation in Science, Engineering, Manufacturing and Analytics. What Are the Benefits of Building a HPC Cloud? What Are Our Unique Functionalities to Build HPC Clouds? Support for Automatic and Elastic Management of the Computing Service. The powerful CLI and APIs exposed by OpenNebula enable its easy integration with any of the most common job management systems (Torque, Open Grid Engine, Platform LSF…) to automatically provision computing worker nodes to meet dynamic demands. The advanced contextualization mechanisms enable the automatic configuration of the worker nodes. Combination of Physical and Virtual Resources. You can use OpenNebula for the management of the virtual worker nodes in your computer cluster and keep physical resources for HPC performance-sensitive applications that require high-bandwidth, low-latency interconnection networks. Management of Several Physical Clusters with Different Configurations. The multiple-zone functionality enables the management of multiple physical clusters with specific architecture and software/hardware execution environments to fulfill the needs from different workload profiles. Support for Several VOs. The new functionality to on-demand provision of Virtual Data Centers can be used to provide different VOs with isolated compartments of the cloud infrastructure. Support for Heterogeneous Execution Environments. The new repositories for VM appliances and templates can be used to provide users with pre-defined application environments. The fined-grain access control supports the creation and easy maintenance of the appliance repositories, that could be even private for different Virtual Data Centers (VOs). Full Isolation of Execution for Performance-sensitive Applications: The functionality for automatic placement of VMs and the configurable monitoring system enable the ability to define isolation levels for the computing services. The new multiple-zone support extends this functionality to easily manage fully isolated physical clusters. 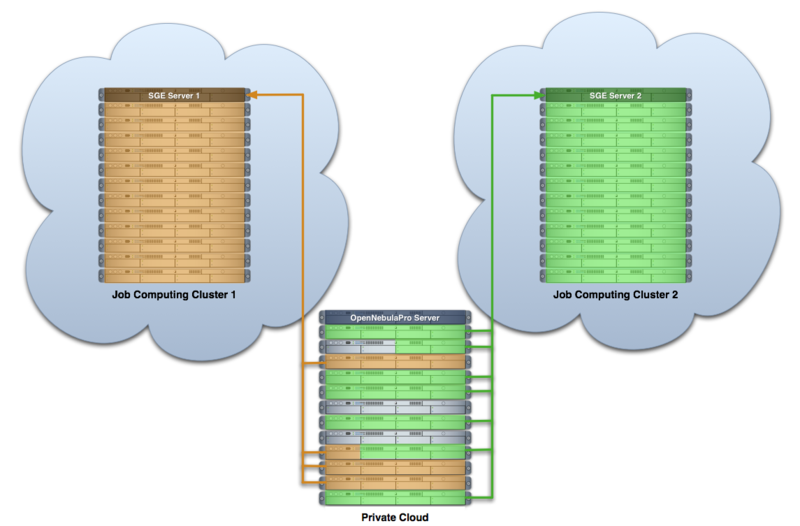 Execution of Complete Computing Clusters: You can deploy multi-tier services consisting of groups of inter-connected VMs and define their auto-configuration at boot time. Cloudbursting to Meet Peak Demands: The hybrid cloud functionality enables the deployment of architectures for cloudbursting to address peak or fluctuating demands of HTC (High Throughput Computing) workloads. Management of Persistent Scientific Data: You can make disks persistent, save changes for subsequent new executions, and share the new disks with other users in your Virtual Data Center (VO). Placement of VMs Near the Input Data: OpenNebula’s scheduler provides automatic VM placement for the definition of workload and resource-aware allocation policies such as packing, striping, load-aware, or affinity-aware. Ensure that each Tenant Gets a Fair Share of Resources: OpenNebula’s resource quota management helps allocate, track and limit resource utilization. If you have a server farm based on any of the ESX versions, then you can make use of OpenNebula to better manage your physical (and virtual) resources in order to build a private cloud and provide virtualized environments. OpenNebula is the most powerful open-source alternative to VMware datacenter and cloud suite, delivering enterprise-class functionality, stability and scalability with broader platform support and integration capabilities. Because it is completely hypervisor agnostic, fully supports VMware, and is easy to install, maintain and use within existing VMware environments, OpenNebula is widely used as an open alternative to VMware vCloud at significantly lower costs. Some of our users also see OpenNebula as a migration tool that allows them to perform a smooth transition from VMware to more open hypervisor alternatives like KVM. In other words OpenNebula leverages existing VMware infrastructure, protecting IT investments, and at the same time avoids future vendor lock-in, strengthening the negotiating position of the enterprise. Finally, companies need to develop a hybrid cloud strategy. We understand private cloud as a complement to public cloud, and this is why we provide unique features to build hybrid cloud deployments. OpenNebula offers a single management interface for internal and remote cloud resources. So before starting the migration from vCloud to vCAC, why do not you give a try to OpenNebula to manage your cloud platform?.